We knew we needed a robust POS System, a reliable POS System, and a user friendly POS system to manage our business, as well as the businesses of our renters. We researched many systems and chose GoAntiquing! --best decision ever! That was 7 years ago and we have had the best service and support from the developer of this wonderful POS software system! I would encourage anyone who is looking for the best in the business to purchase GoAntiquing! Mitzi Ponce, proprietor of 2Cs Vendor wrote this testimonial. I typically put testimonials only on the GoAntiquing! website, but felt this one might be a useful read for a wider audience. Also, consider visiting her on the internets; www.2CsVendorMall.com, FaceBook.com/2CsVendorMall, instagram.com/2CsVendorMall. I should have written this testimonial for GoAntiquing! Point of Sale over a year ago, but I'm glad I waited, because two years' experience with Brave New Software's product and support has given me plenty of time to fully understand just how wonderful GoAntiquing! really is. 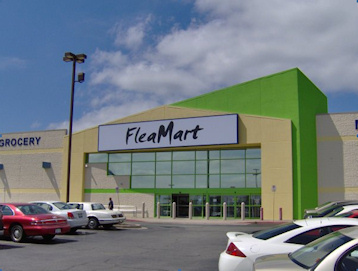 After being a dealer and volunteer cashier in the store, I bought four-year-old 2Cs Vendor Mall in Saint Helens, Oregon, in June 2016 when I retired from my IT career. The mall I took over was a handwritten-ticket, cash-only operation with daily dealer settlements and minimal reporting and tracking. Preparing for the handover, the one change I knew I wanted to make immediately was transitioning to a computerized point-of-sale system. After trialing seven systems and considering writing my own, I found GoAntiquing!, downloaded the trial version, and played around with it. I knew right away that this product would meet my very specific needs and wants. Not only was it ready to go out-of-the-box for our particular situation, but it also didn't tie me in to a cloud solution, which might grind operations to a halt in the event of an internet outage. From day one, GoAntiquing! exceeded my expectations, and – more importantly – exceeded the expectations of my dealers. As I've rolled out changes (credit cards, more days, longer hours, weekly settlements, expansion into unused space, etc. ), store sales and foot traffic have increased, but administrative and cashier workload have decreased. My dealers love the Gateway interface and sales alerts. Because they have access to their sales data, a lot of questions are answered before they get to me (like, “My yellow Pyrex bowl is gone, did it sell?”). My dealers are glad to be able to run sales reports for tax purposes. I also have dealers who advertise their goods on various online selling platforms. They appreciate being able to de-list an item when they see it's sold in the store. For your savviest dealers, the Gateway is a godsend. Being an unabashed geek, I've exported reports and applied my data analysis skills to them, allowing me to share with my dealers statistics about price point, item type, average sale, and the like, helping the dealers prepare for slow seasons and for our (kind of overwhelming) month-long festival in October. Doing word analysis on sales data allows me to say with authority what types of items sell in particular months or seasons. All of that aside, here's what really seals the deal for me: support! Regardless how good a system is, things will go sideways from time to time. Usually (okay, always! ), the root cause is something we did on our end. I've seldom had to call for support, but when I have, the response has been excellent. Be it a holiday weekend or a regular Friday at 6 pm, I've gotten prompt, friendly, helpful responses. Coming from an IT background, I can tell you that such support is very rare. Early this year, I called on the Friday of a holiday weekend and left a message saying that we could tough out our problem until the following Monday. I cannot tell you how surprised and pleased I was to receive a call back half an hour later! That following busy, busy Saturday, we were up and running, no troubles. For a small business depending on the seasonal trade, that kind of responsiveness means everything, and we get it for next to nothing in annual support fees! 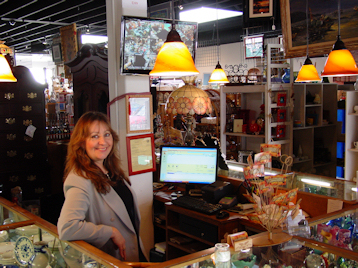 If you're on the fence deciding between point-of-sale systems, feel free to call me to discuss GoAntiquing! I consider Brave New Software to have been instrumental in our growth, and I'd be happy to tell you why. I have used GoAntiquing! Point of Sale since the day I opened in May 2014. The best business decision ever! The support team has always been great getting back to me immediately and is always so helpful. I love the gateway that updates my vendors, we call it the Love Notes. Makes my life so much easier. When we started our business, Yesterday's Antique Market, we spent quite a bit of time researching the internet and making phone calls to others in this same business to get ideas for our new store. One of the best decisions we made was to use GoAntiquing! Point of Sale software for our computer program. Service has been very prompt for the few times we have had questions or needed help. We find GoAntiquing! has been well worth the price and we would highly recommend this program for anyone in the antique mall or market business. Customers appreciate how well receipts are laid out, vendors love the ability to check their sales on a daily basis and the personal printout each month of all inventory sold, and we, of course, love that it takes so much of the headache out of our bookkeeping! "We unofficially opened for business with 2 Dealers, in June 2015. One year later we have grown to 100 spaces rented, with capacity for 125. This is our first venture as a multi-dealer shop, but we are not new to running a business, or antiques. We knew going in we would need to be computerized with 2 POS registers and an office station for reporting, etc. GoAntiquing! was the first software we stumbled upon on the internet. We thought it was great to be able to download a free trial of the program, so we did. We were immediately impressed with the simplicity and the ease of building a dummy store, and using all functions. The diverse reporting ability of the software made it a great program to score others by. As we continue to grow we are very happy with our choice, setting up Dealers and Resellers as part of day to day business is such an easy process for us and cashiers. The reports are invaluable in relaying information back to our Dealers in real time. As with anything new there is a learning curve, we have had to contact Customer Service a couple times, always with quick response, easy fixes and no down time. And, if my husband is comfortable using it, anybody can!! 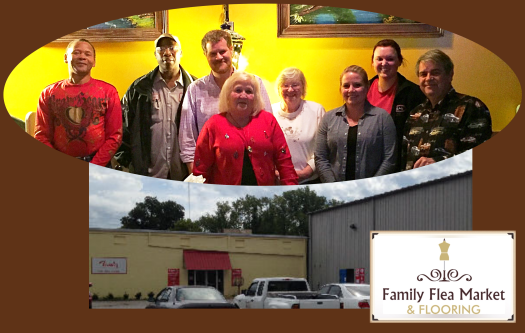 "Family Flea Market & Flooring is one of the largest in-door flea markets in east Mississippi and west Alabama opened year round with over 190 permanent vendors. We opened our doors in July 2012 in our 52,000 sq ft warehouse after spending about a month researching software from multiple vendors. GoAntiquing!, by far, was the most user friendly and adaptable software of the four we tested. We are an unusual lot in that we have items from a DIME up to several thousand dollars including a full service flooring department. We needed a software system that could handle vendors, rents, layaways, and especially our flooring special orders and installations with registers at multiple entrances. Joe and his team at GoAntiquing! gave lots of tips and suggestions on how to make the software handle everything for us including a back office application for book keeping. We pay our vendors out weekly instead of the traditional monthly so we LOVE the ability to print well over 600 checks a month with a couple of mouse clicks each week. And, our CPA loves the program because each vendor payout can create a spreadsheet file (to be uploaded into Quick Books by the CPA) for the accounting side saving us days of manually creating vendor files in QB. We recently went through an audit where they wanted to see paper records from randomly selected days and even the auditor said our sales and day end records were some of the best he had ever seen in this type of business. Our audit lasted a single day!" "When you ask questions like "Why does this do this? Can you make it also do this? ", instead of the run-around, you get a thoughtful and detailed reply, with an answer or a work-around. I would also like to highly recommend their Data Backup service. We have RARELY had a problem but a quick support request at closing and leaving the server online, they were able to correct our issue before the next morning without us hanging around the store since they had access to all of the back-ups. I look forward to many years of business together - Thanks to GoAntiquing! and Joe's team!" 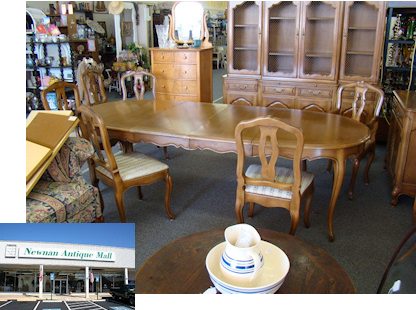 Bargain Hunters Antique and Flea Market Malls We want to recommend the GoAntiquing! Point of Sale software to anyone looking for the easiest and most user friendly software on the market. We opened our first store several years ago using another program that we found to be difficult to use and extremely limiting. We researched multiple programs before purchasing GoAntiquing!, and could not find one to come close to the ease of use and features that GoAntiquing! provides. We now use GoAntiquing! in all five of our locations. Our vendors love the Gateway feature that allows them to receive an email of their daily sales. Our staff members love the ease of entering sales, printing gift certificates, and printing reports. The monthly close-out process is so simple, and we love that it prints our dealer checks for us. We could go on and on about how wonderful this program is, but we will simply say, GoAntiquing! is the best! Our locations, all in Tennessee! 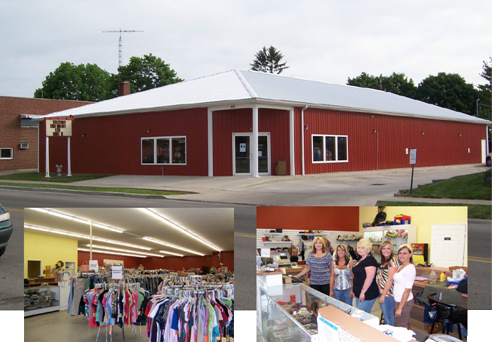 The Vintage Vendor opened its doors May 22, 2015 in Galax, Virginia. Not unlike others who have ventured into the vintage and antique waters we needed to address many concerns before opening. One of these concerns was how to handle point of sale. Thankfully I met another business owner who was using, and loving, the GoAntiquing! Point Of Sale software. Wow, what an amazing find! This software is not simply intuitive it is down-right 'simple'. I did little more than watch the provided training videos a few times. In fact, as if putting off studying for an exam, I waited until the last minute to actually open the software to attempt to use it...almost laughable how quick I had vendors and information loaded. For anyone considering the GoAntiquing! software - do it! There is simply no better way to handle POS...you will be amazed and happy...I promise! Great product...Great customer support! 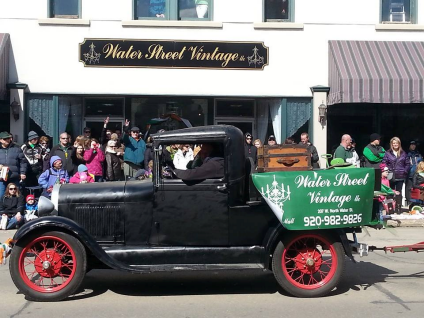 Water Street Vintage, 207 West North Water Street, New London, WI "We have got to tell you the software is working really well for us. We had plenty to learn opening a new business but GoAntiquing! has been a breeze. On opening day we had several family and friends helping who had never seen the software and were so busy (good problem to have) that they had to jump on the register with zero training. We ended the day balanced to within a dollar with hundreds of transactions of all types, so clearly easy to learn and use. Thanks again!" We purchased GoAntiquing! Point of Sale software in November 2012. Prior to the purchase of this amazing software, we used a database. We had no idea what we were missing. This software is designed to be user friendly and efficient. It has totally streamlined the overall operation of our antique malls. The dealers love the reports, notification emails and the simplicity of accessing their accounts on-line. Support is always just a phone call away for any issue we might have and responds immediately to any submissions. We thank GoAntiquing! Point of Sale for simplifying our jobs and lives! 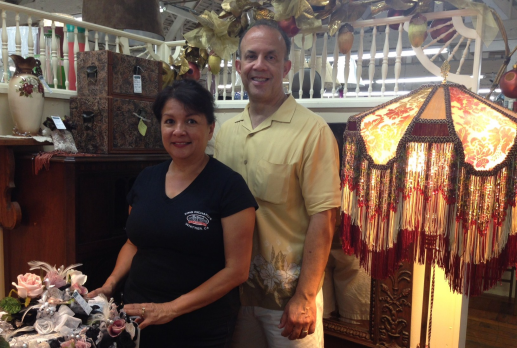 "We can't imagine operating our store without GoAntiquing! Point of Sale. It has streamlined our operation saving us a lot of time doing for us what we used to do by hand, including printing dealer checks at the end of the month. Most important to us has been the responsive service we have received whenever we have questions or need assistance. Our phone calls are always answered and our issues have always been addressed. This level of service after the sale is a big reason why we recommend this product. The Gateway option is one of the best features in that our dealers can manage their inventory from any location away from the store. The "what have I sold" phone calls have stopped and the dealers love it. With close to 70 dealers from all over the state this saves us all time and money. When in the Atlanta Georgia area please come see us. We are located just 12 miles northwest of Atlanta in historic downtown Marietta." 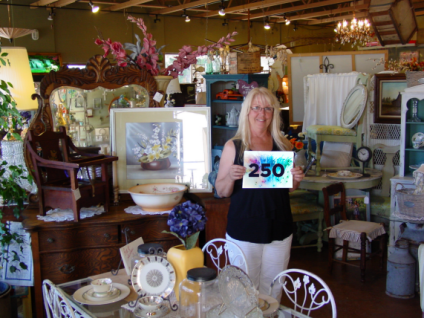 Vada Mason, customer #250! 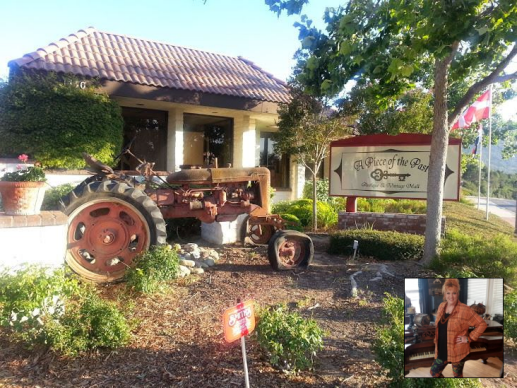 The Old Potting Bench, Arroyo Grande, CA In Vada's own words... “OMG, GoAntiquing! is awesome… My life in my store has changed forever. The support staff has been so supportive and able to address my every need. I should have done this a long time ago. What a great product!" With six antique malls over five states, we knew picking a new Point of Sale software mean finding a system detailed enough to handle the several hundred dealers in each of our malls. Our list of desired features eliminated many software vendors. GoAntiquing! was the only vendor that had what we needed. It was important for us to have a “Sale Parking” feature so pre-entered transactions could be retrieved from any of the registers. We also needed to provide a customer-facing display. And, we looked specifically for ease-of-use options. We wanted to create a better and faster customer experience. We found all these points (and many more) with GoAntiquing! The switch has saved us time and money while making a better customer experience and when questions or concerns arise; support has always been prompt and efficient. We look forward to being a GoAntiquing! customer for a long time. 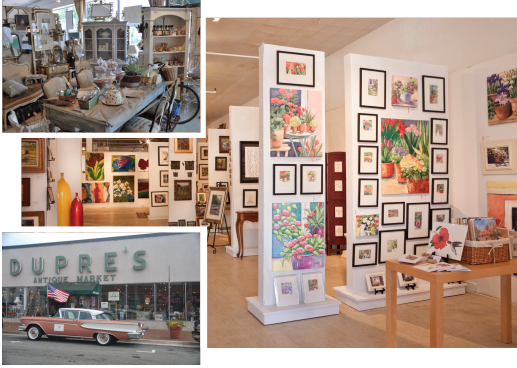 475 Morro Bay Boulevard, Morro Bay, CA 93442 Mary, the shop manager has this to say, "I love having GoAntiquing! Point of Sale it helps me track vendors on a daily basis, and the Internet Gateway helps the vendors track their sales when they are at home. End of month settlement processing is a dream, and the support is very helpful and courteous." Jason Linker, owner of the shop comments, "We have been using GoAntiquing! for about a year and half now. Early on we discovered that the daily close report did not quite give us all the information we needed to let us easily input the sales into our Quickbooks software. GoAntiquing! Support and Product Management listened to us and they did a great job in not only adding the data that we needed, but they also aligned it in a manner that made it a very simple task to input into Quickbooks at the end of each day. GoAntiquing! took a process that originally took us about 20 minutes a day to search for and print out separate reports to a simple click of a button to print the daily close report that now included all of the data necessary for accurate data entry into Quickbooks. We now print out the daily report which includes sales, tax amounts, internal charges, & credit card/atm charges and then input the data directly into Quickbooks, all in a matter of about a minute. Thank you for yet another time saver with your software." 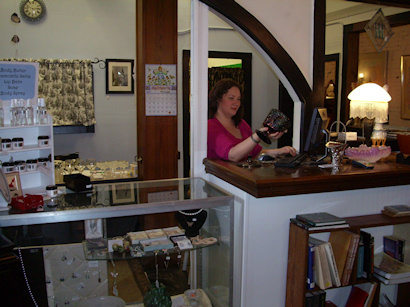 Mary bought the shop from Jason and continues to operate it using GoAntiquing! Point of Sale. "GoAntiquing! 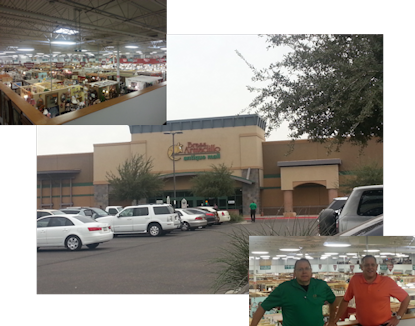 Point of Sale Software – is working EXCELLENT for our Consignment Store! We're so glad we selected GoAntiquing! Point of Sale software for our Chic Repeats consignment store that opened in January this year. The software is doing everything we need to effectively manage our consignment store business. After doing our research, your product appeared to have the most and best features and benefits. Since purchase and installation, we’d have to say the product and your company’s service has far exceeded our expectations! The software has been really helpful to us through the start-up phase and will be even more beneficial as we start to utilize all it’s full capabilities. It’s so easy to keep track of all the transactions and financial results…after we receive the consigners and items into the program." 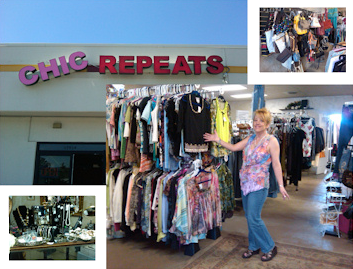 Chic Repeats is located at 17914 Cottonwood Dr., Parker, Colorado. "We have been open since May 1st, 2009. Over the past three years of being in the flea market business we looked at a lot of different point-of-sale systems and were completely impressed with the GoAntiquing! Point of Sale experience. We have 255 booths and 15 employees and had a short period of time to learn the system. It is so user friendly that it takes little effort for the new cashiers to catch on. 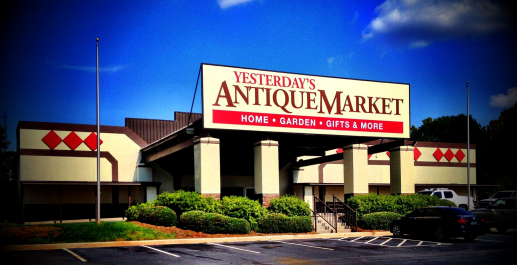 Any questions we have are quickly answered and taken care of by GoAntiquing! support staff. It’s been a very positive experience and we would recommend this system to anyone. In fact call us! Thank you!" 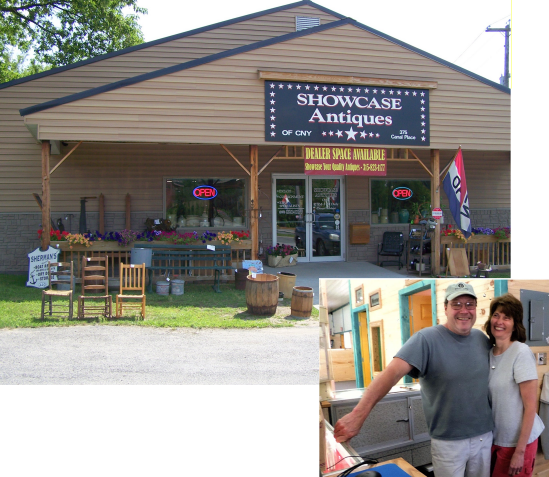 " We started our Antique Mall a little over a year ago. Before that we had a furniture store. The first year we tried several different book keeping ways and nothing was giving us what we wanted for records, we looked at several different ways of doing tags and keeping track of who sold what and it was making us crazy. Then we found GoAntiquing! Point of Sale on the internet and the more we looked into this program it had everything we wanted. I downloaded the free Trial and we used it for a couple weeks and was really impressed on how easy it was to learn and how it seemed to adapt to us the more we used it. I had a few questions so I called the tech support phone number and was very happy to be talking to a "REAL" person who listened and then answered all my questions that is when we decided to purchase the program. We have had lots of compliments on our record keeping now by our dealers as well as the customers appreciate the receipt that we produce now. This program keeps track of everything related to the store. It is great! I would not want to run an Antique Mall without this program. Thanks for a great product and helping us learn a Better Way!" 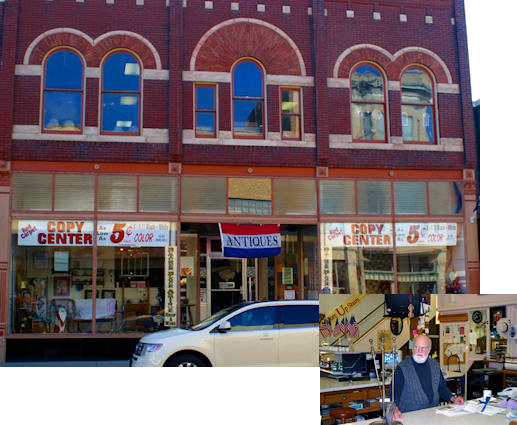 Find us on the web at http://butcherblockantiques.com, or come and visit in person at 216 W 1st Street, Dixon, IL. 61021. Email butcherblock@grics.net. Abby's Treasure Trunk, 209 W. Main St., Visalia, CA 93292. NOTE: Abby's closed down due to landlord issues and has not reopened. "GoAntiquing! Point of Sale is easy. 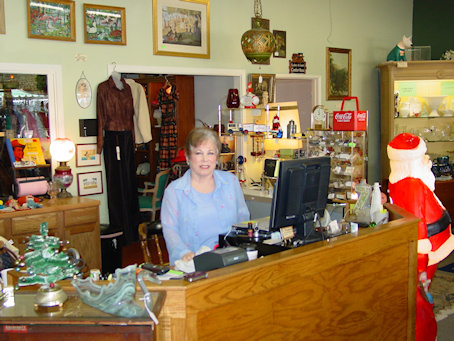 Newnan Antique Mall has been using GoAntiquing! for almost 2 years now. GoAntiquing! has enabled us to easily keep track of sales for our vendors as well as making it easier to keep accurate records for the store. To top it off the courteous support staff have always been quick to assist with any problems or questions. Thank you from all of us at Newnan Antique Mall." - Teresa, Beth, and Tom Little. Newnan Antique Mall is located at 95 Temple Avenue, Newnan, Georgia. Contact the shop at (770) 683-7467. NOTE: This shop closed due to economic conditions, but the owners retain rights to their license for GoAntiquing! Point of Sale and can reopen some day. Rebecca Pintado of Rebecca's of Brewton states: "GoAntiquing! Point of Sale is at the heart of my antique business. Without this program keeping me organized I would not be able to run efficiently. One of my favorite aspects of this system is the ability to back up my database daily to the GoAntiquing! Data Backup website. Having additional records of my transactions gives me great peace of mind. The user interface is extremely easy to master, even my computer illiterate associates pick it up quickly. Technical support is always an email or phone call away. I also love that the system is updated regularly with improvements. I did an enormous amount of research before picking this system and have never had a moment's regret. Thanks for this highly satisfactory service!" 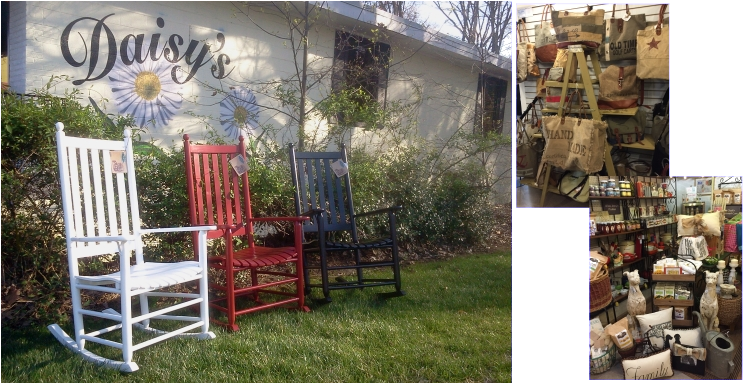 Rebecca's of Brewton is located at 101 Saint Joseph Ave in Brewton, Alabama. Contact the shop at (251) 867-4618. NOTE: Rebecca's had to close after a flood damaged her shop too heavily to reopen. Lookout Mercantile is a small Northwest Arkansas country store located in the middle of Hobbs State Park, midway between Rogers, AR and the tourist town of Eureka Springs, AR. 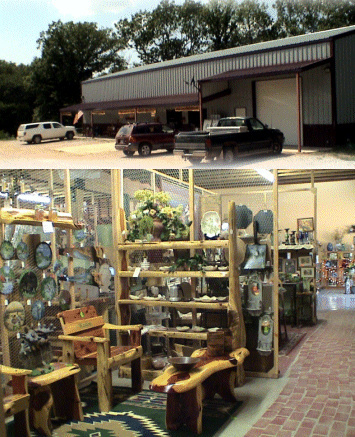 Lookout Mercantile sells rustic furniture crafted on site and by local area craftsmen, hand painted home decor, Antiques and Collectibles, as well as Groceries, Hardware, Camping, and Fishing supplies. Lookout Mercantile also sells bar-coded retail items, as well as via booth rentals and consignment sales. 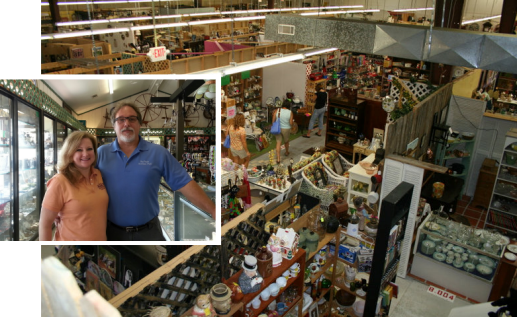 Ken Zey, owner and shopkeeper, has this to say; "We looked very hard for a software package that could handle both the flea market and consignment business along with retail sales and finally found it in GoAntiquing! Point of Sale. Of all the software demos we worked with, GoAntiquing! Point of Sale is the only package that could effectively combine flea market type sales with true bar-coded retail sales, and was one of only two packages we found that could handle the Arkansas retail tax structure with separate tax levels on food vs. other general merchandise." And... "We are very happy with GoAntiquing! Point of Sale and the support has been excellent!" Lamplighter Mercantile & Trading Company, Visalia's newest antique mall, has just opened and is using GoAntiquing! Point of Sale. Larry and Kathleen Harrington, long-time antique dealers are excited to open their shop right in the middle of Visalia's antique district. Welcome aboard folks! 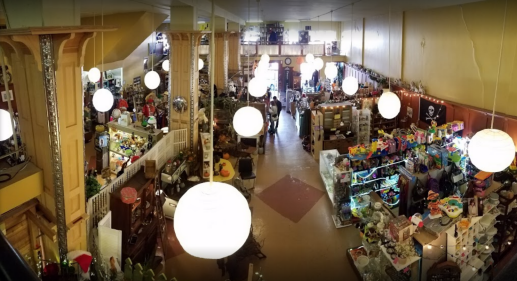 Main St. Mercantile, an antique shop in downtown Visalia, has made the decision to replace their existing point-of-sale software, Antique Mall Manager, with GoAntiquing! Point of Sale. 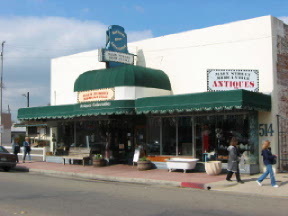 Located in the heart of the Visalia antique district, Main St. Mercantile is one of the longest operating antique shops in the area. 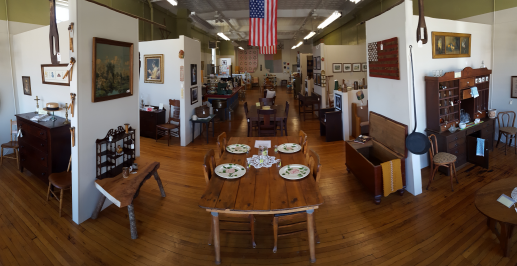 The Mercantile is the third customer to use GoAntiquing! Point of Sale, and the first to make the right choice and switch from a competitors product. John Schomp, co-owner of the store has this to say, "This software does just what we need! Brave New Software responded quickly to our requests for some critical features such as support for our existing receipt printer, a new Fees module, and a planned expansion of the Reseller module. By contrast, the competitive product lacked many features, had not been updated in years, and was difficult to train cashiers to use." NOTE: The shop changed hands and is now owned by Larry and Kathleen Harrington, who also own Lamplighter Mercantile & Trading Company, another shop that uses GoAntiquing! Point of Sale. 601 E. Main St., Visalia, CA 93292 In June of 2002, Paris Flea Market opened it's doors and began selling it's dealers' diverse range of antiques and collectibles. Brave New Software has partnered with Paris Flea Market to provide an advanced point-of-sale system to handle the complex needs of selling in a market where it is rare for two items to be identical. To handle these needs Brave New Software developed GoAntiquing! Point of Sale. This point-of-sale program runs on a standard Windows PC with a receipt printer, optional electronic cash drawer, magnetic card reader, and barcode scanner. The place where this program excels is in it's ability to track layaway sales, consignments, commissions, discounts, rents, customers, you name it! Reports are available for giving feedback to the Dealer as well as for the shopkeeper. "Paris Flea Market is to be commended on it's decision to boldly utilize the technology of today to sell the items from yesterday. GoAntiquing! Point of Sale enables shopkeepers to manage standard sales, layaway sales, consignments, and discounts in a straightforward and easy to use application that was designed from the outset to reduce the total cost of ownership and management of a dynamic retail environment." 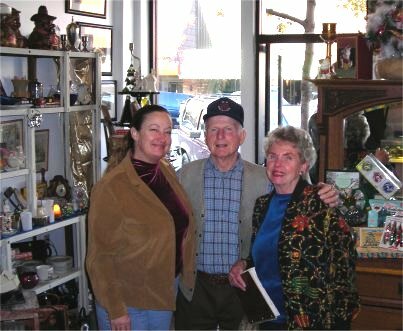 UPDATE - September 19, 2003: Building on the success of their first venture, the owner of the Paris Flea Market has opened a second antiques and collectibles business in downtown Visalia, CA. 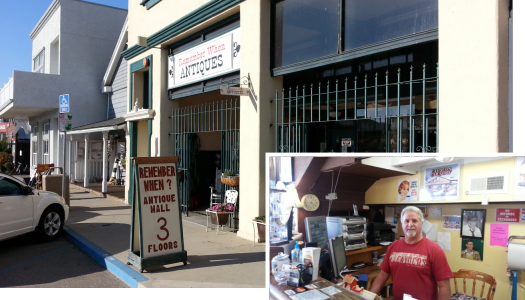 Located within the Paris Flea Market, the new store, Affordable Treasures has implemented GoAntiquing! Point of Sale with anticipation of repeating the success of the Paris Flea Market. NOTE: This was the first shop to use GoAntiquing! Point of Sale, when it was owned and operated by Bob and Florence Ewert.